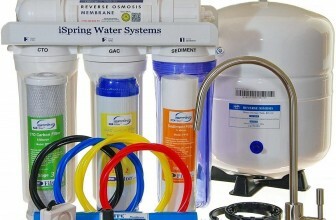 The On The Go OTG4-DBLSOFT Portable Water Softener is unique in that it produces twice the gallons compared to all of the other the standard models. 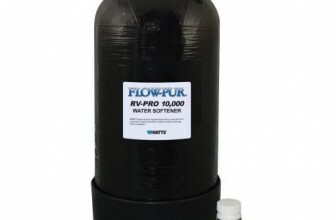 It is also considered to be the largest compact RV softener on the market today. This softener is for the owner of any RV/Marine model and supplies 40% more soft water than most other units. All you need are two boxes of table salt and it will regenerate in less than 30 minutes and provide the user with soft water up to 40 days or 1600 gallons. It can easily be installed in the most tight places because it has a compact design. This product is also very easy to carry due to its top handle, 360 swivel, high grade premium resin and several other useful features. You don’t need tools or electricity in order to use this product and it can be easily stored away in dock side lockers or in your storage bay. It allows high flow rates with very minimal drop in pressure. The softener offers soft water and prevents hard water & rust stains, and helps you to get rid of scale build-up and taste and odor in your water. Below are a few things you should take into consideration when deciding whether or not to purchase the On The Go OTG4-DBLSOFT Portable Water Softener. 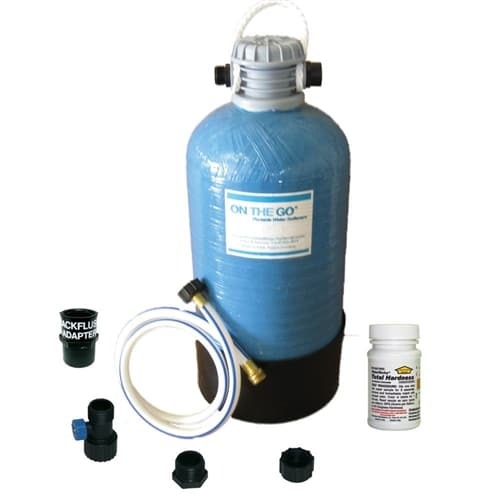 The On The Go OTG4-DBLSOFT Portable Water Softener has an inlet high-flow shut-off control valve that allows very slow rinses which result in improved water quality as well as greater capacity. It has been designed with 360 degree swivels so that the user can easily connect the inlet hose and carry it around with damaging it. This softener also includes a Back-flush adapter for quick reverse connections. Unique, patent-pending designs include the hardness test strips, its storage inlet/outlet caps, inlet hi-flow shut off valves, back-flush adapters, high pressure 4′ white drinking hose and also full cradle bases so that you can ensure that is secure & stable. For those who are looking for a solution that is very easy to execute, then you will be excited to know that there is nothing more simple than the On The Go OTG4-DBLSOFT Portable Water Softener. You simply connect your water supply hose. Using the supplied test strips, just before you connect, you can easily test how hard your water is. After you connect you softener and flush the system, and the test should show a lower reading on the color chart. One of the best things about this product is that it is portable, so if you are in an RV then you will find it extremely easy to travel from place to place with. The more people there are, the harder your water may be which means the more you will have to regenerate, depending on how much water you use. And this is very easy to install. All you have to do is buy a funnel and add salt. The use of regular table salt makes this project very inexpensive to operate. Though this product seems to be ahead of the pack, there is something that could be better about it. It works well, but the plastic hose fittings can be a little awkward. It does not seem to be very strong, especially if it tips over. Just like all other softeners, it really depends on what you need. If you own a residence that is mobile or you are always on the go, then the On The Go OTG4-DBLSOFT Portable Water Softener is the perfect product for you. You need something that does not require a lot of maintenance and as noted previously, this product is number one when it comes to how many gallons it can hold. Its great that the manufactures took the design into consideration when making this product because most of its users will be on the go. 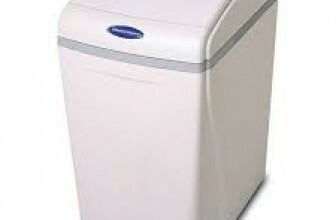 One of the best and most notable things about this softener is that it does not require much time or investment. Unlike most of its kind, you will not be forced to buy extra tools in order to install it. Nor will you have to hire a plumber in order to ensure that it is properly installed. You simply hook it up to your hose and add a little table salt. This process could not be more simple and is perfect if you travel a lot. 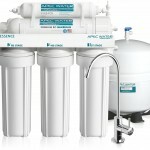 Need a whole house water softening system? Read our review on the Nuvo H20 DPHB!